Anyone who knows Steve knows he hates stupid signs and notices super glued all over the place. He’s the guy who DOES rip the tag off the mattress even though they say not to – rebel! 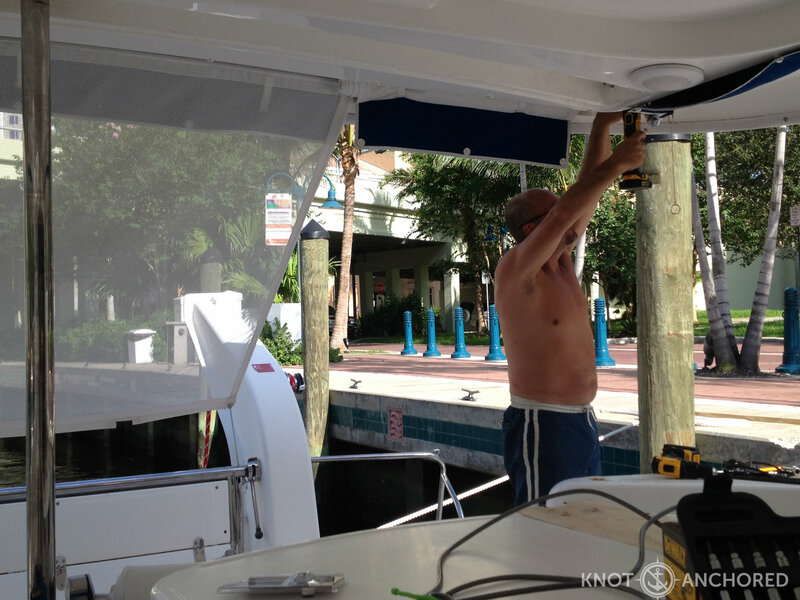 The boat’s no different… So we started to rip them off. 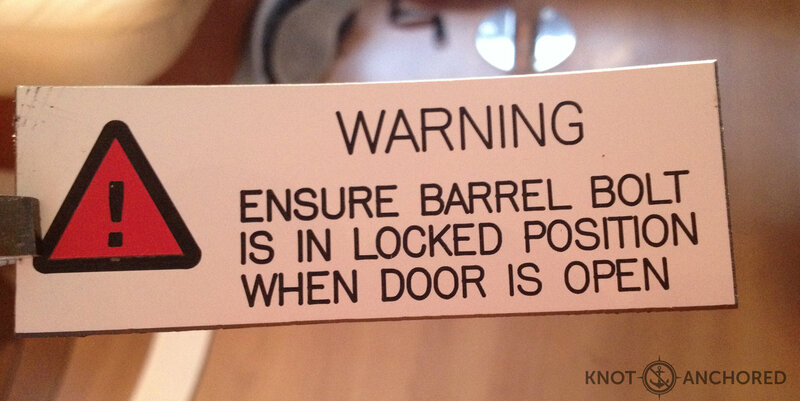 Everyone look at this sign – cause you will no longer find it aboard! Next favorite pass time of Steve’s is throwing things away. As mentioned in a previous post. 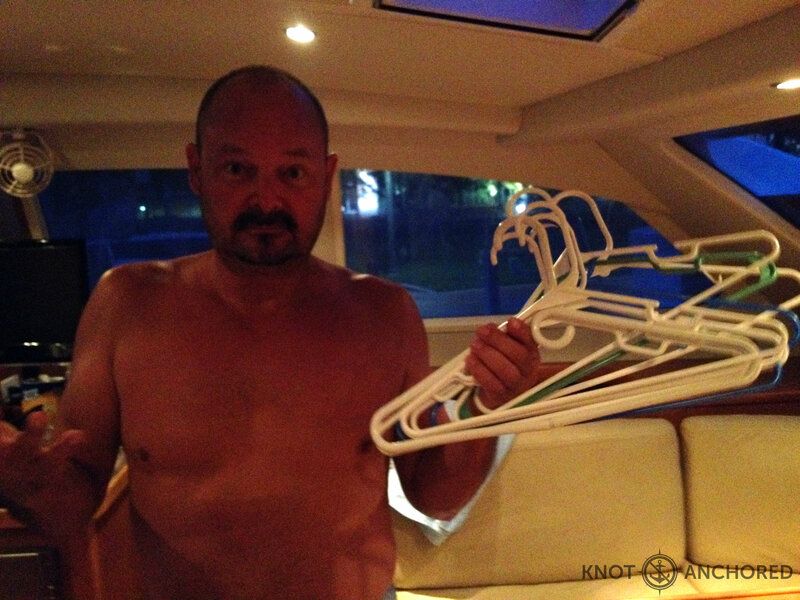 Hangers are a funny kind of thing on a boat. 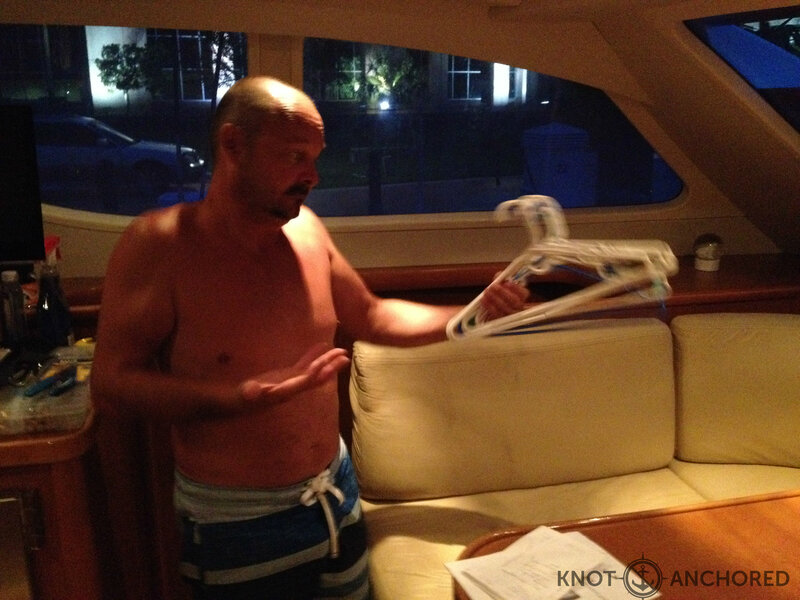 I mean really what gets hung up on a boat like this? It’s not like a big cruise line where you need a dinner jacket or dress up clothes for dinner. But we’re not going to have that option cause all the hangers are gone now so don’t bring your formal wear if you’re coming to visit! 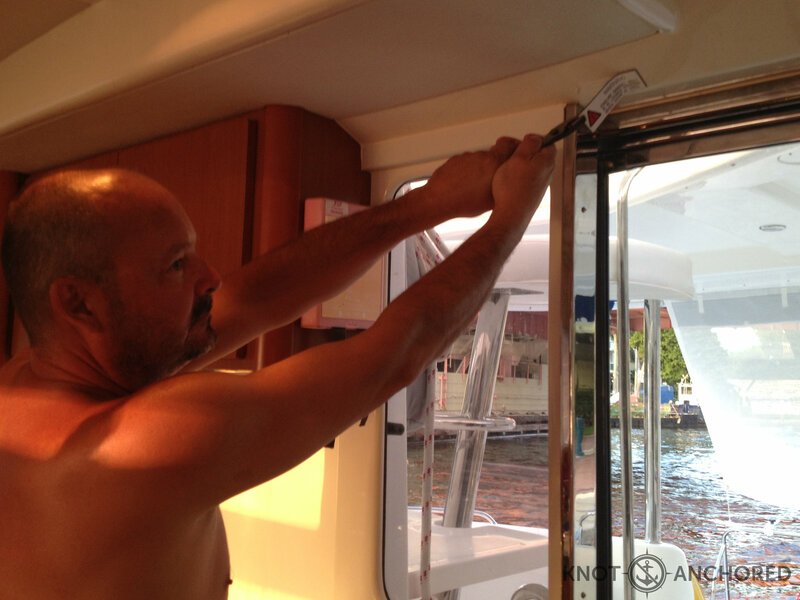 To take it one step further, Steve also removed the closet rods! 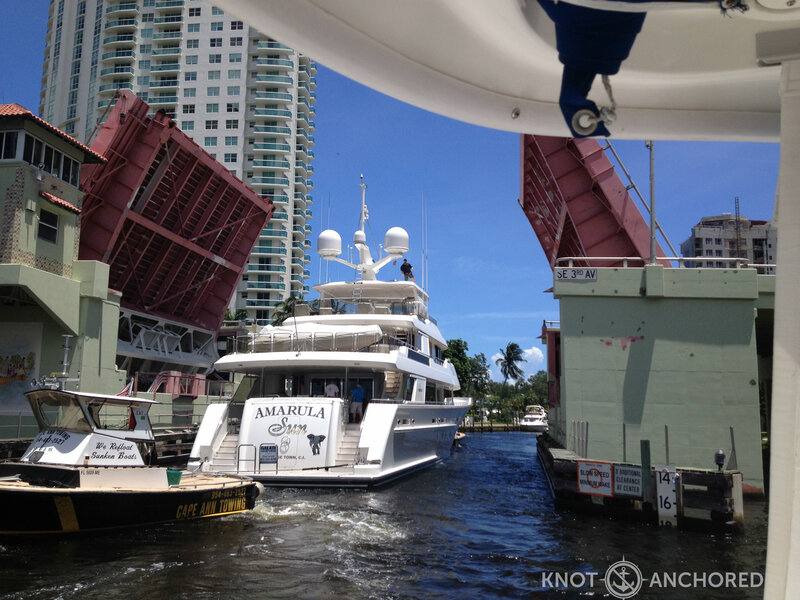 We see a lot of boats go by here, being situated 10ft from the 3rd Ave Bridge. This reminded me of a show my kids used to watch Mighty Machines where you learned the power of a little tugboat. 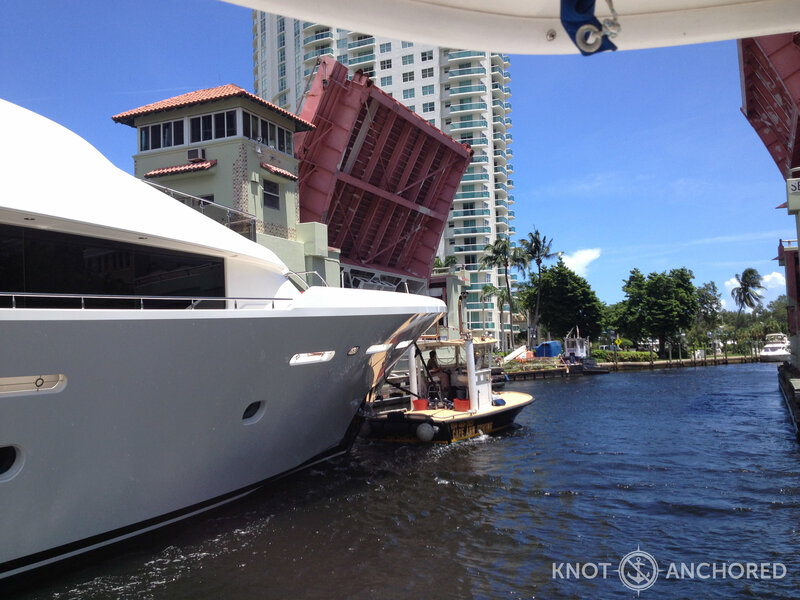 You see when boats are way too big they need to be guided through this narrow river. Here’s a closer look at the little guy. And under he goes. Pretty impressive to watch. Now at the stern of this boat you have the same thing only that tug is reversing the whole way through. Quite a process. Must get kind of boring for the crew at times puttering through. 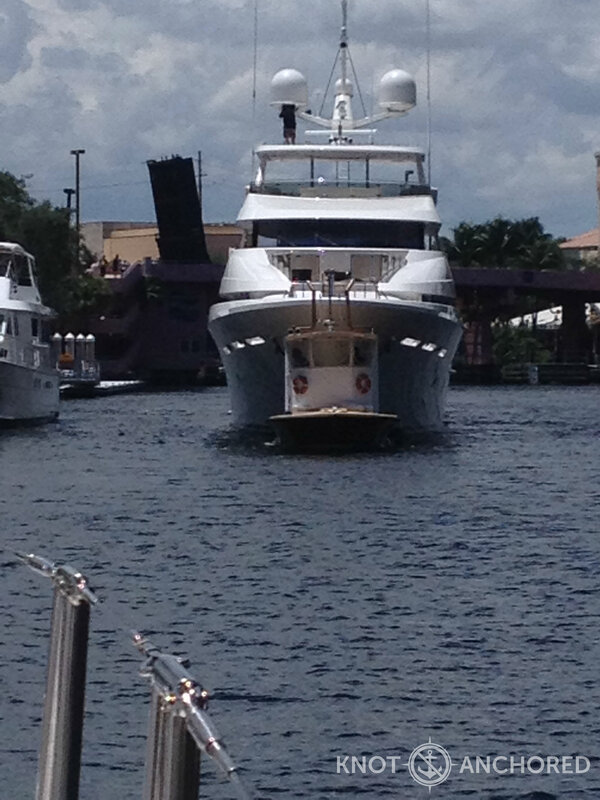 Notice the guy on the very top of the boat? He was enjoying being filmed and put on a bit of creative acrobatics up top there. Pretty funny. Yes that’s the electrical panel hanging open. Tools on the table, tools on the floor it’s like a Dr. Seuss poem. You see the chrome support post to the left of the picture – there used to be one where Steve’s standing too! Our starter tender. We’re going to need to get around once we’re in the Bahamas with the kids and the tender we want is something that needs to be ordered. We’ve been doing a lot of shopping. A LOT! The thing about Steve’s creative process is that it’s backed up by the skills to make it happen. I now know more about plumbing parts then I ever thought I wanted to. The Home Depot’s here are meh. We have found some great suppliers for our needs. The secret lies with NOT telling them t’s for a boat $$. 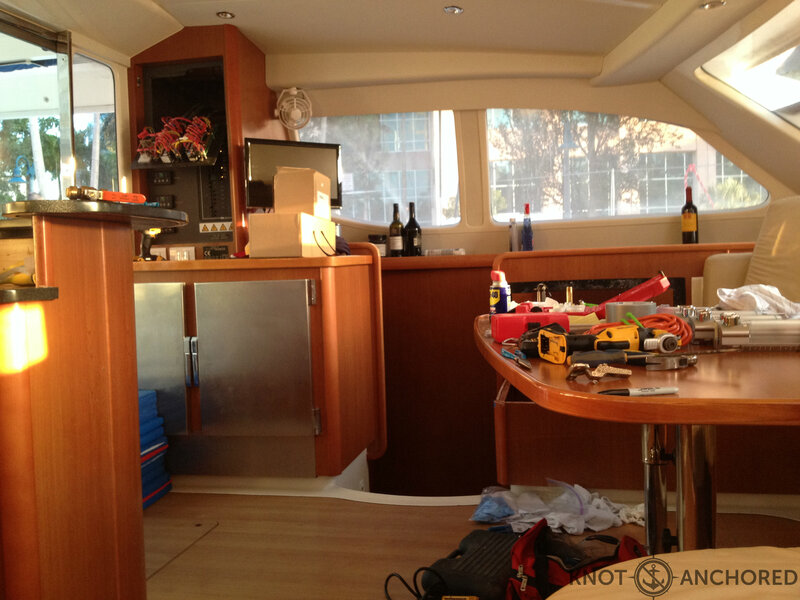 A boat needs a lot of things. A Yeti cooler is definitely one of those things. 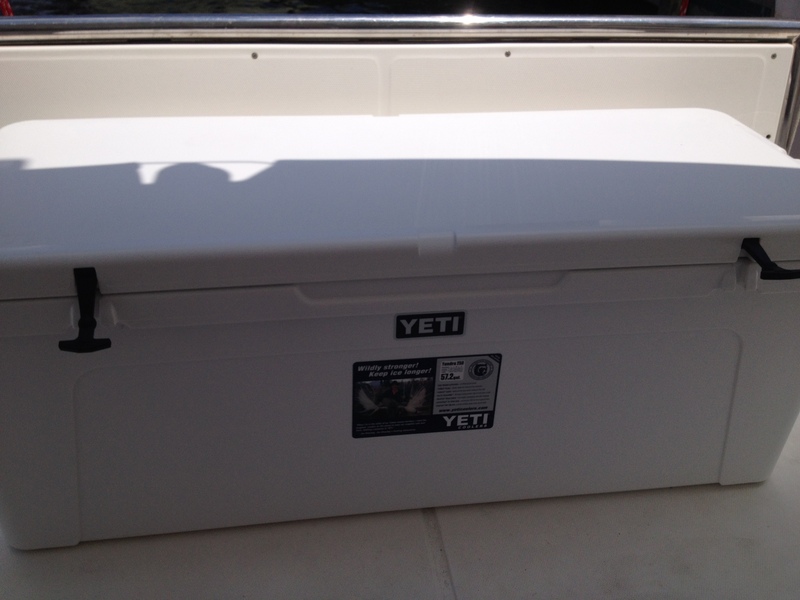 This is the MAC DADDY of coolers. 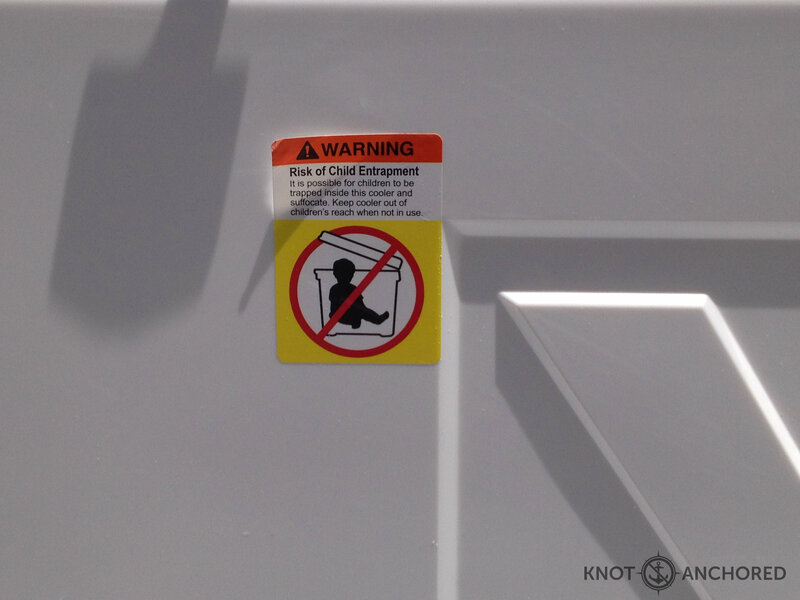 Apparently you shouldn’t put your kids in it…wow really? Then again if you knew our kids! West Marine is a new stomping ground for us. It’s basically the equivalent of what Canadian Tire is to Canadians to boaters. Let’s call it a boater’s shangria la shall we? 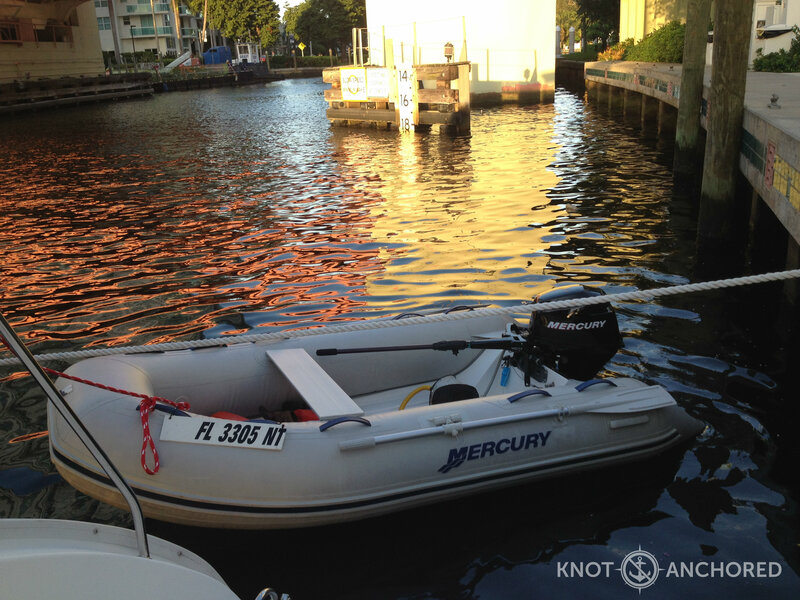 Sure you could get the equivalent for less if you shop around and get creative but in the end if it’s for your boat, it’s here. That’s a lot of boat stuff, seriously! Unfortunately that bill was all we could fit in the Subaru in one shot, we’re not finished! Going back today!!! 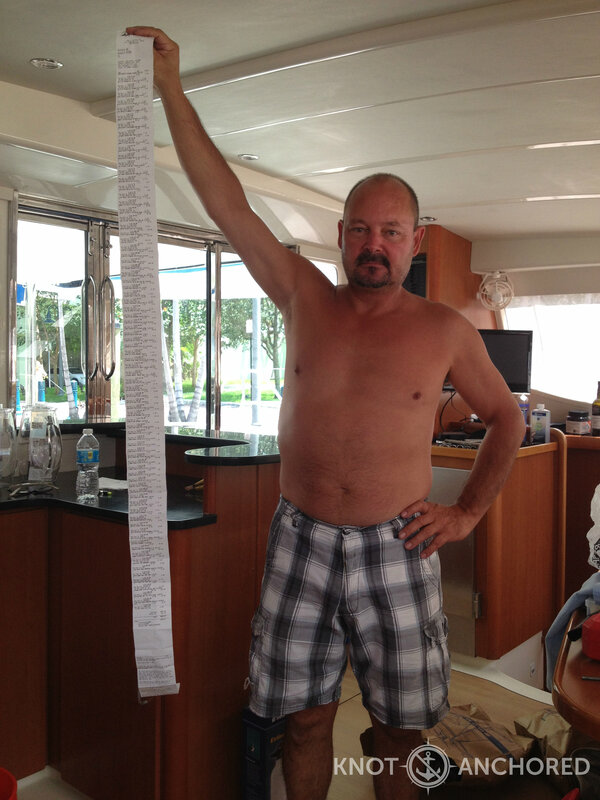 great reading, where will you be boating to or should i say yatchng to besides the Bahamas? 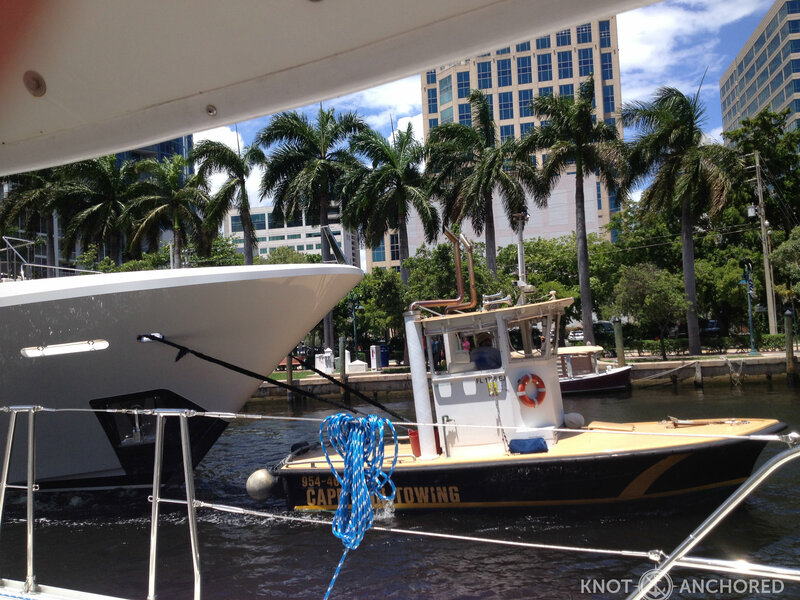 Well after Bahamas we are back in Fort Lauderdale for a couple weeks for more upgrades etc. After that the island hopping down to BVI begins!